You have come to the right place if you are interested in purchasing an Amish made bed. Our Amish bed category is one of our fastest growing and most popular categories. 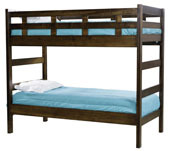 We offer many styles of beds in any of the most popular sizes from twin, queen, king, and California king. We also carry several styles and forms of beds, such as solid wood panel beds and Amish storage beds. We have handpicked several of what we feel are the best Amish bed builders in the country, so you, the customer can feel assured you are getting the best possible quality bed available, without need to worry about quality control. None of our beds are built with particle board which is constructed with a plethora of harsh and toxic glues filled with chemicals. Each Amish made bed is made of solid hard wood, which is shaped, cut, refined and finished into environmentally friendly heirloom furniture masterpieces. The hard wood used in our beds is sustainably harvested domestically in the Midwest using the most environmentally friendly harvesting techniques available. Once the wood is harvested, it is processed in mills located near where the wood is harvested which minimizes pollution and energy costs before taking another short journey to our builder’s shops where our environmentally friendly furniture pieces are handcrafted. The styles of Amish made beds we offer range from the traditional styles such as Mission, Shaker, Queen Anne, and pieces with a blend of the three, to rustic log furniture built by hand from natural pine wood. Our traditionally styled beds are available in the most popular domestic woods, including, oak, ¼ sawn white oak, cherry, brown maple, hard maple, hickory, rustic cherry, rustic hickory. Each wood type has at least 3-4 stain colors that can be applied to match your current décor scheme, or other furniture pieces. We can also paint your bed in about any color you desire. The most popular paint colors are white and black with a matte finish. If you don’t see the stain color or paint you are looking for on our site, please contact us and we can make arrangements to match a different color you have in mind by producing custom wood samples.